Fast and faster change over to other canformats is and was always a key feature of all CAN MAN products and it was relatively obvious to many of you that an „automated positioning” of those BIG 8 – monobloc cutting heads, had to come as a logical next step. Watching the actual movements of this „auto positioning” is rather boring because it’s very slow but the effect of the automatization is still tremendous as the operator can „forget about“ the 2nd cutting operation and focus on the adjustments and settings of the rest of the slitter. 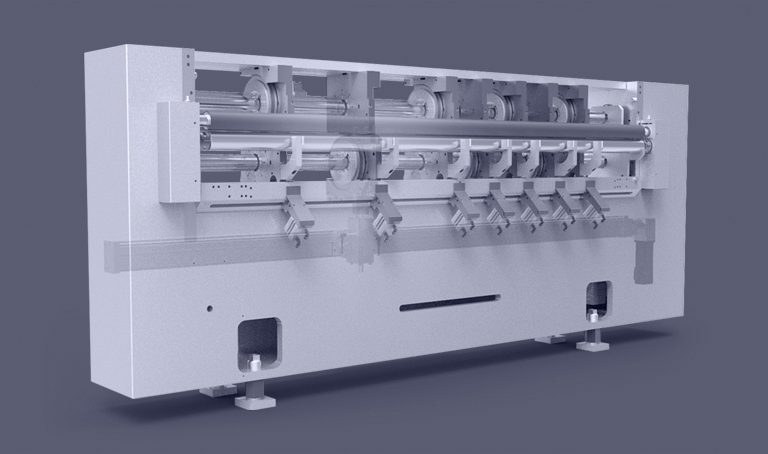 Therefore in 20–40 minutes* the entire slitter is ready for production and with a PowerSTORE™ between the slitter and the welder, you’ll be able to complete a format change within 10′ (canbody height) or 30′ (complete format change). The slow (torque controlled) movement is also required by safety regulation, because this auto–setting–mode is active while a person is „around“ the machine doing the other setting jobs on it.